The Sloane Equity and Inclusion in STEM Introductory Courses (SEISMIC) leverages the power of 10 participating institutions, including University of California, Santa Barbara, to identify and collectively address issues related to equity and inclusion in STEM Learning. 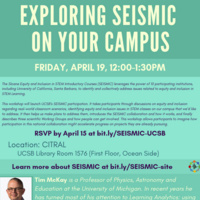 This workshop will launch UCSB’s SEISMIC participation. It takes participants through discussions on equity and inclusion regarding real-world classroom scenarios, identifying equity and inclusion issues in STEM classes on our campus that we’d like to address. It then helps us make plans to address them, introduces the SEISMIC collaboration and how it works, and finally describes three scientific Working Groups and how people can get involved. This workshop allows participants to imagine how participation in this national collaboration might accelerate progress on projects they are already pursuing.